Canada has a heart of gold. And also just a lot of gold. 1. When the Canadian Institute of Diversity and Inclusion released this response to Russia's anti-LGBT laws. 2. When an Olympic qualifier took one for Team Canada and gave up his spot to another teammate. Gilmore Junio (left) gave up his spot in Sochi to Denny Morrison (right), a three-time Olympian who did not qualify in his 1,000-meter speedskating event during the trials in Calgary last month. “How Denny is skating now, I believe it’s in the best interest of the team if he races,” Junio said. "To represent Canada at the Olympics is a huge honour and privilege but I believe that as Canadians, we’re not just here to compete; we are here to win. Denny has proven to be a consistent medal threat in the distance." And then Morrison went on to win silver! Which really was a win for both Morrison and Junio. 3. When, shortly after his win, Morrison started a Twitter campaign to select Junio as Canada's flag bearer during the Sochi closing ceremonies. 4. When a Canadian coach helped a Russian skier complete his Olympic race with dignity. Russian athlete Anton Gafarov crashed during his run, breaking his left ski. After stumbling to finish the course, Canadian cross-country coach Justin Wadsworth ran onto the slope and replaced the broken ski. "I wanted him to have dignity as he crossed the finish line,” said Wadsworth. 5. 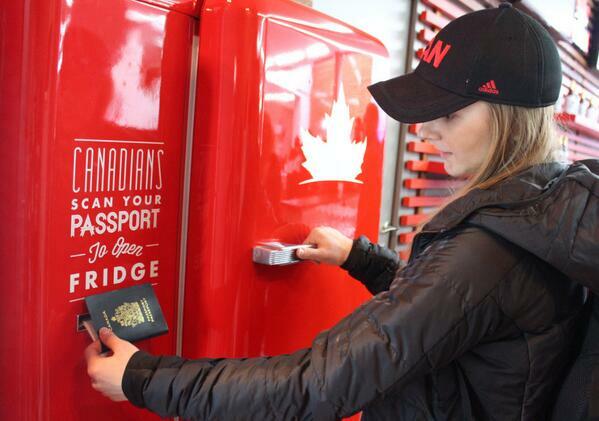 When they showed everyone up by creating an ingenious beer fridge that can only be accessed by a Canadian passport. Canada excelling in Sochi "@Molson_Canadian: Spotted! The beer fridge in Canada Olympic House in #Sochi #wearewinter "
6. When Ottawa's mayor shut down some haters in the best possible way. 7. When only two of the Dufour-Lapointe sisters took medals home but all three siblings cheered for each other. Canadian freestyle skiers and sisters Chloe Dufour-Lapointe (left) won silver and Justine Dufour-Lapointe (right) won gold. Even though their eldest sister, Maxime (below), finished 12th, she continued to cheer her siblings on from the crowd. 8. When, after beating his fellow countryman to get gold, Alex Bilodeau left his competitor with only kind words. The two Canadian freestyle skiers grew up skiing on the same slopes, with the same clubs, and under the same coaches. When Alex Bilodeau (right) won gold over his close competitor Mikael Kingsbury (left), who won silver, Bilodeau graciously passed the torch. “That guy that finished second, he is going to win everything after I’m gone,” Bilodeau said. 9. When Bilodeau then dedicated his Olympic gold to his brother who has cerebral palsy. 10. And when — amid all sportsmanship and thoughtfulness — Canada actually won a bunch of medals.